Grab a hold of the SensatioNAIL Invincible Gel Polish coupon today to save $2.00 on your next purchase. The $2 coupon savings is good for any SensatioNail color gel polish. The coupon is valid for any purchase of any Polish color $9.97 or more. You can only use one coupon per item you purchase, so no combos or stacking with this coupon set. It is the manufacturer’s coupon which means (like always), that you can use this coupon at any retailer that carries SensatioNail Gel Polish. 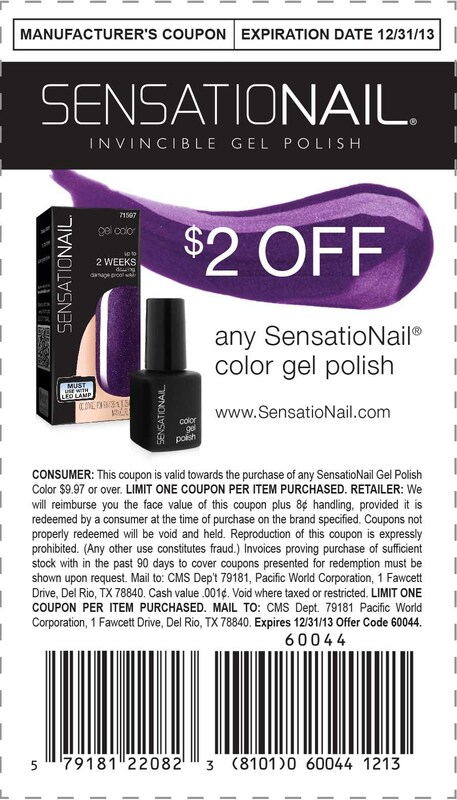 You can always go ahead and purchase a SensatioNail Gel Polish product from their website at www.sensationail.com but I’m not sure if you can use the coupon, since this coupon is a printable manufacturer’s coupon with a barcode. There is a section at the end of the coupon description that says the Offer Code is 60044, so you can always try and see if that can be used online when you checkout, but no guarantees. This printable coupon is definitely good in retail locations. You could find these products at locations like GNC, CVS and quite possibly, any nail salon you might get your manicures from.